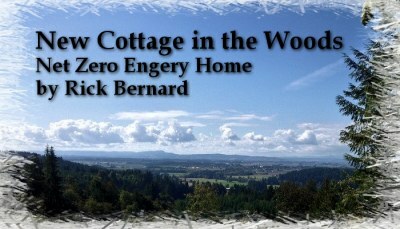 Freelance writer Nancy McCarthy interviewed Bernard about his beginnings and his work on custom homes in the metro Portland area as well as on the Oregon Coast in Manzanita. Rick Bernard still occasionally sits on the giant driftwood tree stump he had so carefully placed in front of a house he built in Manzanita in 1997. I’ve loved this thing from the first time I’ve seen it; it’s everything I’d ever hoped for in a stump,” quipped Bernard, who obtained the permit, then supervised as the stump was lifted from Nehalem Bay, loaded onto a flatbed trailer and slowly driven to the home site on Third Street in Manzanita. After it was in place, a neighbor asked if it had always been there – which was exactly the response Bernard had sought. Even 30 years after building his first home – the log home in North Plains where he lives and keeps his main office – Bernard still gets wrapped up in his projects. This year, they include two more houses in Manzanita, where Bernard also has a home and office. Bernard’s free-spirited personality suits his vocation as an independent builder. “We have a homespun approach. We’re hands-on guys. Describing his focus and attention to detail, the article describes client Bill Wagner’s story of the custom home Bernard built for their family. I found him in the garage putting paper all over the floor so oil from a car wouldn’t get on it,” Wagner said. “He takes discarded wood flooring off a pile and puts it in the attic because we might need an extra piece of flooring in 10 years. If we ask about using a nail in a certain area, he will give you the third act of Aida about what will happen with the nail if it gets wet and rusts. Bernard admits in the article that he loves dealing with the clients. “The fun part is dealing with e clients, extracting from them the house they hold in their hearts.” He admits that he remains friends with his clients long after their home is finished and lived in. ← What Do I Need to Know About Windows?